Proceedings of the Thirteenth Vertebrate Pest Conference, (VPC-1988 Published at the University of California, Davis, November, 1988. 326 pp. 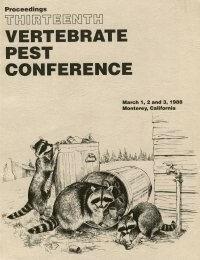 Description: Proceedings of the 13th Vertebrate Pest Conference March 1-3 1988 Monterey, CA, arranged by the Vertebrate Pest Council of the Vertebrate Pest Conference Editors A Charles Crabb, Rex E. Marsh and Assistant Editors Salmon, Terrell P., and Beadle, Dorothy E.